Gas restaurant series range with deep capacity oven. 59-1/16" wide, 27" deep work top surfaces. Stainless steel 5" wide front plate rail. 6" legs with adjustable feet. Griddle or optional hot-top with cast iron "H" style burners, 20,000 Btuh in lieu of open burners. One piece oven with porcelain interior and heavy duty, "keep cool" door handle. Heavy cast iron "H" oven burner rated 38,000 Btuh Oven controlled by even bake, fast recovery snap action modulating oven thermostat. 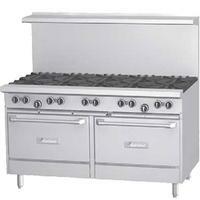 Range, 34" Wide, 6 Burners (24,000 BTU), Modular, Open Burners, Electric Ignition.